The temples in Northern Thailand are perfect destinations for travelers who want to learn about Thailand’s rich history, vibrant Buddhist culture, and intricate Thai architecture. The region is known for housing some of the most famous temples in the entire country. Chiang Mai alone, the capital of the north, has over 300 wats! With amazing ubosots, chedis, and vihrans on almost every block deciding which temple explore is difficult. 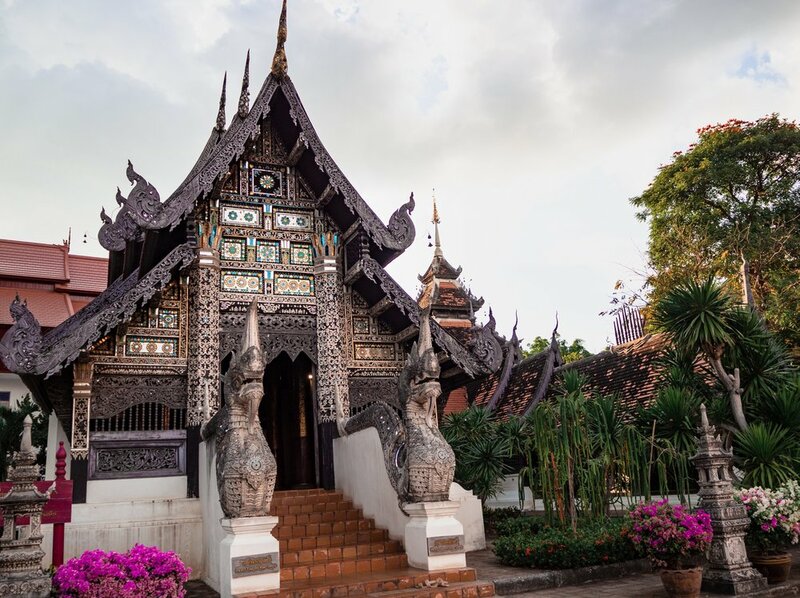 We put together a list of the five temples in Chiang Mai you must see before you leave. In the list you will find reasons why you should visit, the temple’s brief history, how to get to the temple, and the entrance fees. Lets start temple hopping in Chiang Mai, Thailand! Situated on Thailand's highest peak, mount Doi Inthanon, Wat Doi Suthep gives spectacular views of the jungle and clouds resting on Chiang Mai. According to Buddhist lore, Wat Doi Suthep was built in 1383 to commemorate a white elephant that trekked to the top of Doi Inthanon with a piece of bone from the Buddha's shoulder. The relic is said to be housed within the golden chedi situated in the center of the wat. You can find elephant symbolism and statues throughout the wat, including a large figure outside of the temple. The wat is situated 3.2 miles up the Doi Inthanon mountain. There are multiple ways to get up to Doi Suthep. Pro tip: the road up to Wat Doi Suthep is very curvy! If you are prone to motion sickness take a Dramamine before the drive. The most expensive but most luxurious mode of transportation is via private car and driver. You can stop whenever and wherever you like including the waterfalls along the road. You can easily arrange a private car and driver from your hostel or hotel. The cost is approximately 600 baht. If you enjoy exercise, you can opt to walk or bike up the mountain. Have a songthaew take you to beginning of Si Wichai, the base of the road to Wat Doi Suthep and trek up the rest of the way yourself. Pro tip: there are two waterfalls along the road up to Wat Doi Suthep. If you are trekking up via walking or biking, we recommend stopping at one or two. For adventure enthusiasts and those who love being in nature, we would recommend hiking the 2.2-mile monk's trail up to Wat Doi Suthep. We chose this route up to the temple, watch our review of the monk's trail for more in-depth details and how to get to the trailhead. Pro tip: The monk's trail takes you another small jungle secluded temple outlined by a waterfall. Admission is 30 baht per person. Wat Pha Lat is a must see for those who enjoy jungle hikes and treks. The temple is secluded and surrounded by verdant wildlife and a waterfall. Since so many tourists miss this small temple on the way to Doi Suthep, there are no crowds or tourists. Enjoy the peacefulness of the temple all to yourself! Constructed for pilgriming monks up to Doi Suthep, monks used the temple to rest and meditate before continuing on their journeys. With the construction of the road to Doi Suthep, most of the temple fell to ruins due to the lack of pilgriming monks and upkeep. However, reconstruction and maintenance of the temple are underway. Most monks now use the secluded temple for meditation retreats instead. On your tour to Wat Doi Suthep, you can ask your driver to stop at Wat Pha Lat. The road to the wat is accessible from the main road to Wat Doi Suthep. Follow in the steps of pilgriming monks and take the traditional journey up to the temple via the monk's trail. Orange monk robes mark the path making it easy for hikers to get to the temple. Read our blog post on how to get to the trailhead in our post, "Adventure Enthusiasts you Will Love the Monk’s Trail to Wat Doi Suthep." Wat Sri Suphan is also known as the "Silver Temple" because the entire ubosot (ordination hall) and holy relics are gilded in silver. 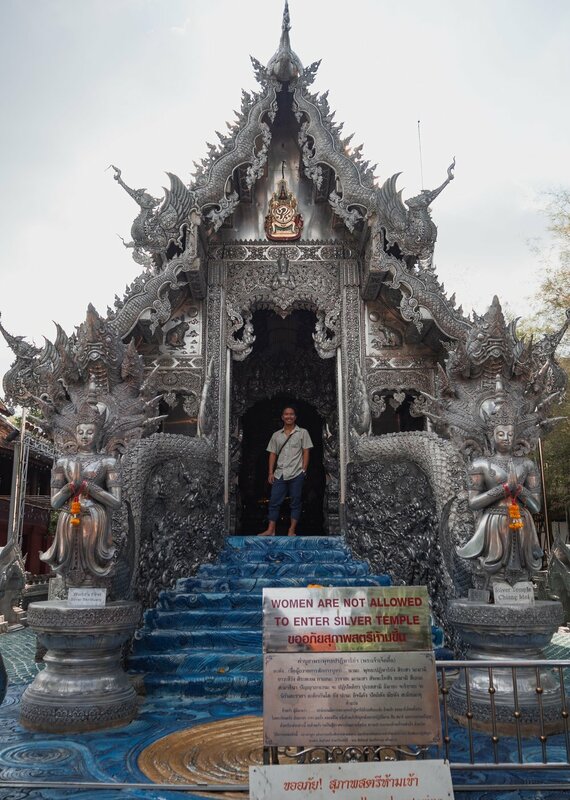 The temple stands out since it’s the only one in Thailand to showcase traditional Lanna silversmith design and decor. Today the temple also serves as "Monk Chat" school. Tourists are encouraged to learn more about Buddhism and get in touch with their spiritual sides. You can participate in a Buddhist chat on Tuesdays, Thursdays, and Saturdays between 5:30 pm and 7 pm. The wat was initially constructed in 1501 BC and reconstructed various times through Thai history. In 2004, the temple was redesigned with silver to promote and protect Lanna silversmith's traditions. Visitors are encouraged to watch silversmiths work and learn more at the "Lanna Arts Study Center." The only parts of the original temple are the sema stones around the ubosot and pillars inside. Word of caution: women are not allowed into the ubosot. Lannan lore states underneath the temple are 500-year-old relics which in a women's presence would "deteriorate." Women, be respectful of the culture and refrain from entering the ordination hall. Wat Sri Saphan is right outside the southern edge of Chiang Mai's old city. The wat is on Wua Lai Road next to a night market. If you are close, you can walk there like we did or have a songthaew take you there for about 30 baht. Admission is 50 baht per person. Wat Chedi Luang once housed the sacred emerald Buddha between the 13th and 15th centuries. Despite large earthquakes and a Burmese invasion, the chedi ruins are well preserved and still the tallest structure in Chiang Mai. Carved elephants and nagas surround and protect the sacred building. On the chedi’s grounds is a smaller temple, Wat Phan Tao. The ornate black teak and glass tiled temple houses a large reclining Buddha. Wat Chedi was built in 1391 BC and continuously expanded until it reached its final size in the 15th century. The chedi was once home to the emerald Buddha until a massive earthquake toppled parts of the chedi forcing the move to the emerald Buddha to Wat Phra Kaew. A large vihran with ornate pillars and a vast red ceiling was added to Wat Chedi Luang in 1928 and houses a giant standing Buddha initially constructed in the 14th century. Wat Chedi Luang is located almost smack dab in the middle of Chiang Mai's old city. You can walk if you’re close or take a songthaew to the ruin. If you are traveling within the old city limits, all songthaews are 30 baht no matter where you are going. Don't let songthaew drivers rip you off! Wat Phra That Doi Kam is home to the largest Buddha in Chiang Mai. You can see the 55.8-foot Buddha for miles around the city. The wat also houses one of Chiang Mai's oldest chedis built in the 7th century. The wat is far outside of the city center and does not see many tourists. Thus, the grounds are quiet and crowd-free. Locals pilgrim to Wat Doi Kam to pray and make offering daily. If you want to experience a wat full of Buddhist practicing, including incense burning, prayers, and offerings of huge trays of jasmine flowers and marigolds then Doi Kam should be your go to. Plus the temple also offers beautiful views of Chiang Mai. Buddhist lore tells a story of cannibal giants who once lived on the grounds of Wat Phra That Doi Kam. Buddha journeyed to the cannibals, convinced them to stop cannibalism, and converted them to Buddhism. Buddha left the giants with a piece of his hair which the chedi now enshrines. You can see carvings of this story painted in gold and red in the small vihran next to the chedi. Wat Phra That Doi Kam is located 6 miles south-west from Chiang Mai's old city, just north of Royal Park Ratchaphruek. Unless you are staying close to the wat, the best way to travel is by songthaew or taxi. The journey from the city center should cost between 80 - 110 baht per person. Wat Phra That Doi Kam. Do you recommend any other temples in Chiang Mai to visit? Let us know in the comments!